Two girls take a hallucinatory trip into a haunted farm with strange friends while recovering from a disastrous prom night. Teenager Lucy experiences a strange vision while having her teeth whitened by dentist Dr. Meyer. Laura, a patient in the waiting room, briefly greets Lucy on her way out. Lucy goes to prom with her boyfriend Jake, her best friend Annie, and Annie’s platonic acquaintance Sheldon. Although Lucy planned to lose her virginity with her boyfriend, Jake ends up getting drunk and sexually aggressive with Lucy, prompting her and Annie to abandon the limousine and find their own way home. While regrouping at a convenience store, Lucy and Annie meet classmate Laila, who invites the two girls to join her and her friends Zoe and Shanti on a drive to the Honor Farm. At a campfire in the woods, the girls meet up with drug dealer Jesse, Sinclair, and JD, who is later revealed to be Laila’s cousin. While the eight teenagers trip on mushrooms, Sinclair recounts the Honor Farm’s haunted history as a federal penitentiary work site with a reputation for mistreating inmates. Abandoned for decades, the farm is now rumored to be a meeting spot for devil worshippers performing black magic. Everyone has strange hallucinatory experiences while tripping. Lucy and JD take a romantic interest in each other. The group splits up to explore the Honor Farm. Several of the friends discover a mutilated deer. Laila has Zoe and Shanti help her conduct a séance to contact Sam, JD’s brother who died in a fire. Jesse goes off alone while JD, Lucy, Annie, and Sinclair explore an underground tunnel. Everyone soon starts hearing and seeing strange things. Dr. Meyer arrives with his partner Roosevelt, as well as with a baby lamb and his patient Laura, who appears drugged and dazed. Using a large deer head mask and brandishing a knife, the two men begin performing a sacrificial ritual over Laura. Jesse interrupts Laila’s séance. Frustrated over losing contact with Sam, Laila screams, disturbing Dr. Meyer’s ritual and prompting the dentist to briefly search for the teens. When Dr. Meyer resumes his ritual, JD, Lucy, Annie, and Sinclair interrupt. Dr. Meyer warns that they should not stop the ceremony once it is in progress. The teens take the knife from Dr. Meyer and cuff him to a pipe, but Roosevelt slams the deer head onto Laura before running away. Despite bleeding profusely from her head, Laura regains consciousness. The eight teens escape the farm escorting Laura, but fall down an embankment while fleeing. The eight teens find themselves in the woods near a waterfall. Lucy asks what happened to Laura, but no one knows who Laura is. The friends swim as Lucy goes in and out of different visions, including the one from her dentist visit. Lucy and JD kiss. Wearing the deer head, Laura pulls Lucy underwater as Lucy continues having hallucinations, including a flashback to prom in the limousine and an encounter with Laura forcing her to solve a riddle about a donut. Lucy rejoins JD in one of her visions and tells JD she wants her first time to be with him. JD pulls Lucy out of her last vision. Lucy emerges above the water once more. She and JD kiss. In the morning, all eight teens exit the woods and begin walking back to town. Lucy was ready for the prom night of her life, until her boyfriend Jake sent it sideways with too much booze and an inability to take no for an answer. Fulfilling her best friend duties to the letter, Annie has consolation covered with quips, commiseration, and of course, camaraderie. Their dates now ditched, the ladies are in limbo regarding where their evening should head next. Along comes classmate Laila, the sort of free spirited ‘bad’ girl normally not in ‘good’ girl Lucy’s orbit, with an unexpected offer to join her and some friends at the Honor Farm in the woods. The Honor Farm was a prison work site notorious for abusing inmates until decades of disrepair turned it into an urban legend hotspot supposedly haunted by devil worshippers. It’s also an ideal place for local high schoolers to do drugs, conduct séances, and send each other on ill-advised dares, which is exactly what is about to happen. 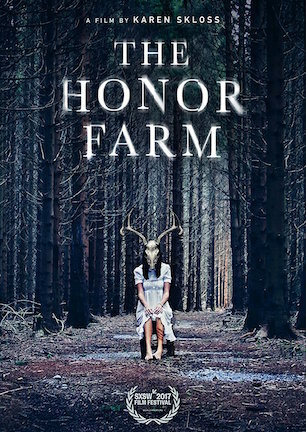 Don’t go getting ahead of yourself by assuming “The Honor Farm” is headed toward predictable thriller territory where horny teens partying on prom night are murdered in single file fashion by a supernatural spirit or masked maniac. This group of eight teens that includes Lucy, Annie, Laila, and new object of Lucy’s eye JD is set to trip on mushrooms and split up to explore the farm’s cobwebbed tunnels. Except the horrors confronted here have to do with evolving individual identities in a time of tumultuous transition, as “The Honor Farm” is not at all the type of typical movie its premise seems to suggest. It isn’t often that I find myself flummoxed in how to approach discussing a particular film. “The Honor Farm” is an unusual project intended to challenge perceptions of cinematic storytelling. Horror tropes are repurposed as frames for finding metaphorical meaning about rites of passage and self-discovery. We’re talking a style centered in an atypical aesthetic that is difficult to describe. With Ebert’s advice in mind, perhaps it’s best I represent this film in the following terms: “The Honor Farm” is like Richard Linklater and David Lynch collaborated on a tribute to John Hughes in the context of a horror movie. The end result is part comedy, part coming of age drama, part thriller, part experimental exploration of cinema. At the same time, it is none of these things. Does that make sense? Maybe it shouldn’t. Maybe that nonplussed notion is essential in coming closer to understanding exactly what “The Honor Farm” is. A majority of the movie takes place in a hallucinatory mindscape where the plotline isn’t persistent. From the drugs, from the environment, from her own internal conflict, Lucy exists simultaneously in multiple realities of her own making. The camera cuts between these visions where fact and fantasy merge. Time and truth are in flux, creating a nonlinear story with a cryptic message left to each individual to divine. My personal worldview prevents me from connecting with “The Honor Farm.” I find its themes disjointed (it says many things without seeming to say any one thing), its editing choices odd (some sequences abruptly jump to moments where a specific action onscreen is difficult to discern), and its overall substance unrewarding (hence my difficulty in finding a firm focus to examine). Yet assigning unfavorable values to any such elements may not be fair. Because not only is it possible (likely?) that I am incapable of relating to “The Honor Farm” in the first place, perhaps I was never meant to. I’m a man born in the back half of the 1970s. My radar has rusted into a position where tuning to a teen girl’s adulthood evolution as funneled through an amalgam of genre conventions is a proposition very far behind the eight ball. Mine is a reaction less likely for a demographic to whom the film’s unique perspective may feel fresher and more relevant. Rather than run roughshod over what does not work for me, I’ll spilt the rating down the center and say that any given viewer may be more likely to award “The Honor Farm” only one star or the full five depending on personal preferences. Hopefully, Ebert’s wisdom guided me to give insight in ascertaining which side of that line you’ll probably fall. The only thing I have left to add is, don’t expect a horror movie, don’t expect tangible formula, maybe don’t have any expectations at all. Whatever your expectations are, “The Honor Farm” is highly likely to invert, subvert, and convert them all at the same time. March 15, 2017 by Ian Sedensky.